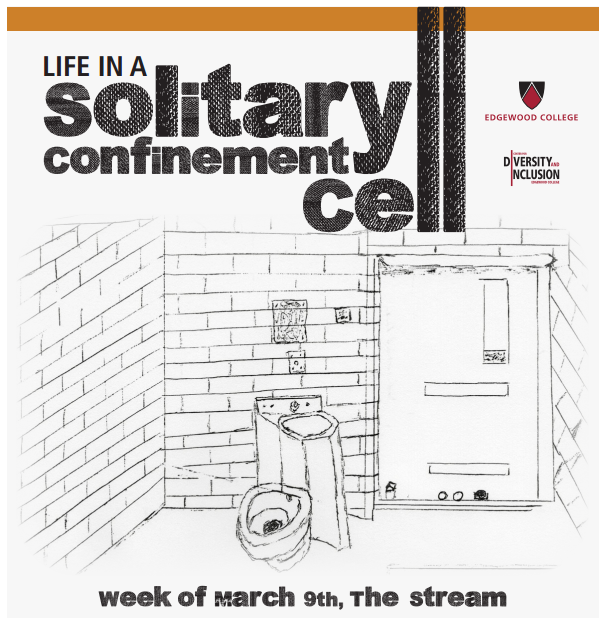 During the week of March 9th, stop by The Stream in the Theatre Arts building at Edgewood College in Madison WI to experience life in a solitary confinement cell. This experience is contemplative in nature and campus-wide participation is encouraged. The Solitary Cell can be reserved for an individual over a 30 or 60 minute time period. Please contact Tony Garcia, tgarcia@edgewood.edu, for group/classroom visits. Hi, if anyone from the project sees this, I was hoping to write a story about the solitary cell experience project for The Badger Herald, a UW student newspaper, and was wondering if you’d be open for a brief interview sometime soon. Chiefly I’m interested in the concept behind the project, but we’re also looking for information regarding how many people have tried it/are signed up to try it and what kinds of responses you’ve received from participants. In that vein, if this article proposal sounds agreeable to you, we’d also like to speak with some of the participants to get their thoughts on the experience. The article would probably run on Monday in our print addition. If you’d like to be a part of this, please don’t hesitate to let me know and we’ll figure out a way to get in better contact. Is it possible to just see the cell without taking the entire time to spend there? Yes, most likely. Please use the Edgewood College contact in the post. Thanks for your interest!